In personnel, if not in official lineage, the 104th Fighter Squadron can trace its origins to 1920 when the Flying Club of Baltimore was organized for former World War I Army Air Service reserve officers of that city. This club became part of the Maryland National Guard in 1921 when Maryland formed one of the nation’s first post-war flying units with the creation of the 1st Observation Squadron in Baltimore which received federal recognition on 29 June 1921. The 104th became the first post-World War I United States National Guard unit to be equipped with its own aircraft, 13 Curtiss JN-4 Jennies, which it flew until 1923. Initially assigned as division aviation for the 29th Infantry Division, the unit operated out of Baltimore’s Logan Field. In addition to Jennies, the 104th flew a variety of other aircraft during the interwar period, almost all of them two-seat biplanes. By this time most of the original Maryland National Guard members had been transferred elsewhere as individual replacements, although a handful were still serving with the unit when it deployed to England in 1943, by which time the 517th Bomb Squadron had been redesignated the 859th Bombardment Squadron, part of the 492d Bombardment Group, Eighth Air Force, a B-24 Liberator group. There is no official lineage however, between the 104th Observation Squadron and the 859th Bombardment Squadron. Meanwhile, the 104th Observation Squadron was reactivated with the 59th Observation Group. 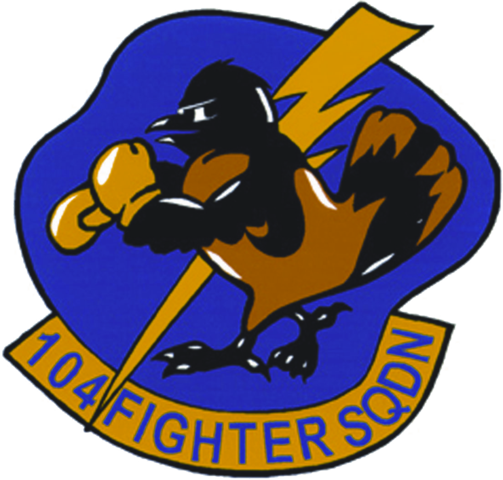 The squadron was redesignated as the 104th Reconnaissance Squadron (Fighter) on 1 March 1943. Equipped with P-39 Airacobras, the squadron was assigned to the 59th Reconnaissance Group, III Fighter Command. Its mission was to train newly graduated pilots from AAF flight training schools to fly single-engine fighter planes as a Replacement Training Unit (RTU). In August 1943, the squadron was redesignated as the 489th Fighter Squadron. However, those changes were administrative in nature, the mission of the squadron remaining the same. The squadron was inactivated and disbanded on 1 May 1944 as part of an Air Force reorganization of its training program. The squadron’s training mission subsequently was carried out by “Squadron B”, Thomasville Replacement Training Unit. With the end of the war, Thomasville AAF and all of its assigned units were inactivated on 30 September 1945. The wartime 489th Fighter Squadron was reconstituted on 21 June 1945 and re-designated as the 104th Fighter Squadron, and was allotted to the Maryland Air National Guard on 24 May 1946. It was organized at Harbor Field, Baltimore, Maryland, and was extended federal recognition on 17 August 1946 by the National Guard Bureau. The 104th Fighter Squadron continued the lineage of the 489th Fighter Squadron and all predecessor units. It was initially equipped with F-47D Thunderbolts. The squadron was one of the first in the Air National Guard and was operationally gained by the Air Defense Command First Air Force. As the ANG command and control echelons were formed, the 104th came under the operational control of the PA ANG 53d Fighter Wing, although administrative control was retained by the Maryland ANG. With the surprise invasion of South Korea on 25 June 1950, and the regular military’s complete lack of readiness, most of the Air National Guard was federalized placed on active duty. The Maryland Air National Guard was not federalized, however its aircraft were replaced by very long distance F-51H Mustangs in 1951 to better carry out its air defense mission. By 1955 the Mustangs were at the end of their operational lifetime, and the Air Force issued a directive to ADC to replace all of its interceptor force with Jet Aircraft. As a result, the 104th entered the jet age and received Korean War veteran F-86E Sabres to replace its propeller-driven Mustangs, which were retired. However, Baltimore Harbor Field was unsuitable for jet aircraft due to the length of its runway, and the squadron was forced to temporarily base its jet aircraft at Andrews AFB, and later at Friendship Airport (now BWI Airport), while it looked for a new home. Eventually, the squadron relocated to Glenn L. Martin Company Airport on 1 July 1957 whose longer runway was necessary to support jet operations. On 1 October 1962, the 104th was authorized to expand to a group level, and the 175th Tactical Fighter Group was federally recognized and activated by the National Guard Bureau. The 104th TFS becoming the group’s flying squadron. Other squadrons assigned into the group were the 175th Headquarters, 175th Material Squadron, 175th Combat Support Squadron, and the 175th USAF Dispensary. With the formation of the 175th TFG, all administration of the unit by the 111th ADW ended. On 13 May 1968 the 175th Tactical Fighter Group was federalized and ordered to active service. It was transferred to Cannon Air Force Base, New Mexico along with the NY ANG 139th Tactical Fighter Squadron and 174th Tactical Fighter Squadron as well as the 104th TFS. At Cannon AFB, the Group’s mission was to act as a filler unit for the 27th Tactical Fighter Wing which were deployed to the Vietnam War. At Cannon, the squadron trained active Air Force pilots in forward air controller duties. The unit did not deploy overseas. The units were returned to New York and Maryland state control on 20 December 1968 when the TAC 4429th Combat Crew Training Squadron was activated with regular active-duty Air Force personnel. In 1970 the F-86H Sabres were transferred after being with the 104th TFS for thirteen years. The 104th was one of the last ANG units to fly the F-86. The Sabres, however, were not retired, but instead transferred to the United States Navy which used them both as target drones and as MiG simulators for TOP GUN aggressor training. The F-86H had a similar size, shape, and performance as the MiG-17 fighter then being encountered over North Vietnam, and many a Navy F-4 pilot was “killed” by a F-86H Sabre during these mock battles. In return, the 104th TFS received Cessna A-37 Dragonfly ground-attack aircraft. In the Vietnam War, the A-37 was a very effective ground support aircraft that was simple to operate, maintain and fly. The mission of the 104th was to train in the aircraft to support Air Force and Army special forces personnel and units. In 1974, after the end of American participation in Vietnam, the unit began supporting the Military Assistance Program (MAP) by supplying training to Latin American Air Forces. In addition, in the OA-37 configuration, the aircraft was used as a Forward Air Control (FAC) aircraft, that replaced the aging O-2 Skymaster. In the OA-37 configuration, the aircraft was equipped with small rocket pods, usually with smoke or white phosphorus warheads used for target marking. Early in the 1990s with the declared end of the Cold War and the continued decline in military budgets, the Air Force restructured to meet changes in strategic requirements, decreasing personnel, and a smaller infrastructure. The 175th adopted the new USAF “Objective Organization” in early 1992, with the word “tactical” being eliminated from its designation and becoming the 175th Fighter Group. Tactical Air Command was inactivated on 1 June, being replaced by the new Air Combat Command (ACC). On 15 June 1996, in accordance with the Air Force “One Wing, One Base” directive, the units of the 135th Airlift Group and 175th Fighter Wing merged to form the 175th Wing. The 175th Wing became a composite organization with an Air Combat Command-gained fighter unit, an Air Mobility Command-gained airlift unit, a United States Air Forces in Europe-gained civil engineer flight, and, from 2006 to 2016, a network warfare squadron. Following the terrorist attack of Sept. 11, 2001, members of the 175th Wing repeatedly volunteered or been mobilized to take part in the Global War on Terrorism. From January to June 2003, the 104th Expeditionary Fighter Squadron was formed and deployed to Bagram Air Base, Afghanistan, where it flew strikes against Taliban and al Qaeda forces and earned the distinction of being the longest-deployed Air National Guard fighter squadron at Bagram.